Taking up from where iconic bands like Deep Purple and Bad Company have left off, HEAVEN & EARTH–guitarist STUART SMITH, singer JOE RETTA, bassist CHUCK WRIGHT, drummer RICHIE ONORI and keyboardist ARLAN SCHIERBAUM–fuse elements of hard rock, blues and bits of classical with bravado and a razor-sharp focus on their new album titled Dig, due out April 23rd on Quarto Valley Records. 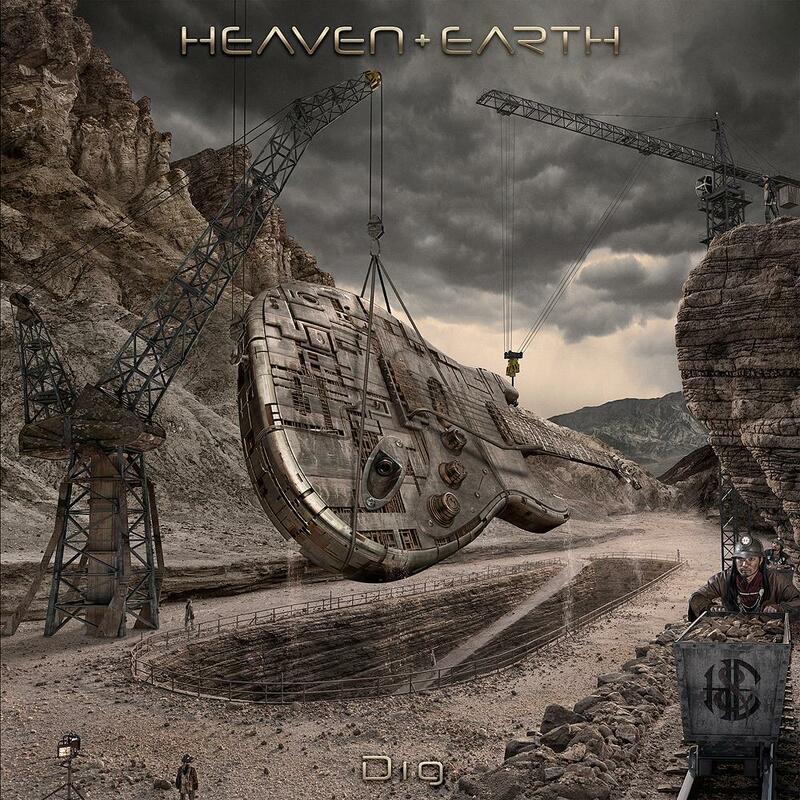 HEAVEN & EARTH, with the support of their label president Bruce Quarto, have taken a DIY approach to recapturing the essence of classic rock by coupling their authentic sound with visuals of the genre. To match the caliber of musicianship on their new album, HEAVEN & EARTH brought in acclaimed photographer Glen Wexler–who is best known for his elaborately staged digital photocompositions of improbable situations–to create the cover art for Dig. Wexler has shot over 300 album covers, including records by Michael Jackson, Van Halen, Black Sabbath, Rush, ZZ Top, among others. ***See the Q&A below with Wexler. During the mid-1980s Glen’s images began to attract advertising clients including Acura, Sony, Jeep, Maxell, Adobe, Intel, Coca-Cola, Capital One, Toyota, Pepsi, Warner Brothers Pictures and hundreds of others. Wexler’s editorial work includes featured photo illustrations for TIME and Fast Company. Wexler also created iconic photographic logos for The Star Wars Trilogy, Batman Forever, Universal Pictures and Geffen Records. Internationally recognized as one of the original artists to incorporate digital imaging technology into the creative process, Wexler is widely regarded as a leader in the field. His work has been profiled in many publications including Communication Arts, French PHOTO, Creativity, Los Angeles Times, Apple Pro Stories, and Adobe Photoshop Innovator’s Spotlight. In this interview Glen talks about the concept behind his artwork for HEAVEN & EARTH’s new album Dig, the importance of the album cover and the resurgence of vinyl. 1. HEAVEN & EARTH are plugged into the classic style of many iconic bands right down to having incredible chops as musicians. What in particular about HEAVEN & EARTH’s music inspired you to work with them? First off, Chuck and Richie were in the first band I ever shot when I was a photography student at Art Center College of Design. I did a school project with them, which was the start of my music portfolio. This led to my first major album cover the following year. Chuck and I have remained close friends throughout the years. Chuck introduced to me to Stuart and Quarto Valley Records president, Bruce Quarto, last June. I was absolutely blown away with the caliber of the project; the musicianship and the breadth of material. And, Joe Retta…he’s one of the best rock and roll singers I ever heard. The tracks were still in progress, but I instantly felt an affinity for the music, like it had been in my record collection since I was a teenager. I believed Bruce was sincere in supporting the project and wanting to do things “right.” I was in, and this project keeps getting better and better. 2. You’re noted for creating album covers for artists such as Van Halen, Black Sabbath, ZZ Top and Rush. What were you looking to achieve in the creation of the album artwork for Dig? As with any album cover, I wanted to create a visual extension of the music. With a new or relatively unknown band, it’s also the opportunity to create a memorable and unique image that will begin to establish their mythology. I also love that we’re doing vinyl with this project. Album covers were my art collection as a teenager and very much influenced my aesthetic and career. There is also something special about the ritual of putting an album on a turntable and becoming engaged in the artwork and liner notes. This was diminished by the small format of a CD. Album covers started to become a lost art, and with digital downloads, a sorely missed part of the music experience. Unfortunately, many of the record labels and musicians have come to the conclusion that the album cover isn’t important anymore. I completely disagree with this notion. Even at the smaller scale, the album cover is the visual representation of the artist and their music. It’s an important part of their identity and marketing. My peers miss the 12-inch album cover and seem to be embracing its resurrection, and it is encouraging to see vinyl rediscovered by younger music fans as well. Thankfully, music supporters like Bruce Quarto get this. 3. How did you develop the idea of a guitar being lifted out of an excavation site, which is the image depicted on the cover? Were you given the title to work with? My idea was the “unearthing of rock and roll,” and to depict the music as an iconic treasure that is being rediscovered. I suggested the title to the guys after the cover was completed. The multiple meanings of the word “Dig” came to mind during a discussion about possible titles and it stuck. 4. Beyond the album cover, you also photographed them in a very unique way. 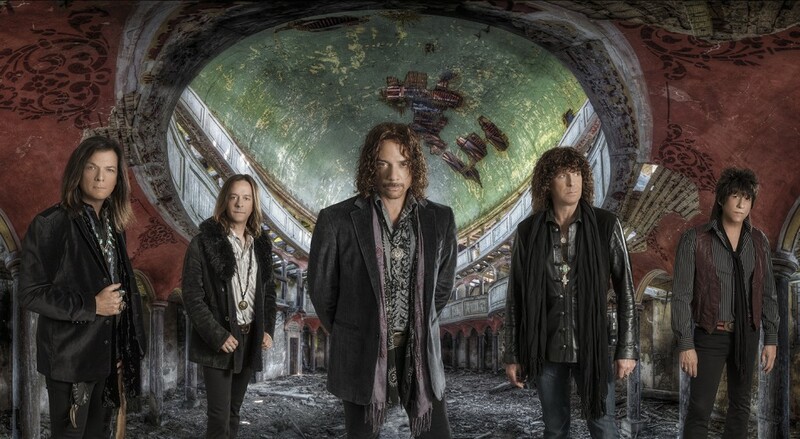 One of the pictures shows the band’s singer Joe Retta levitated (pictured below). Can you talk about why you photographed the band that way? 5. Can you talk about the location where you shot the Heaven & Earth photos (pictured below)? What made it the perfect place to shoot the band? 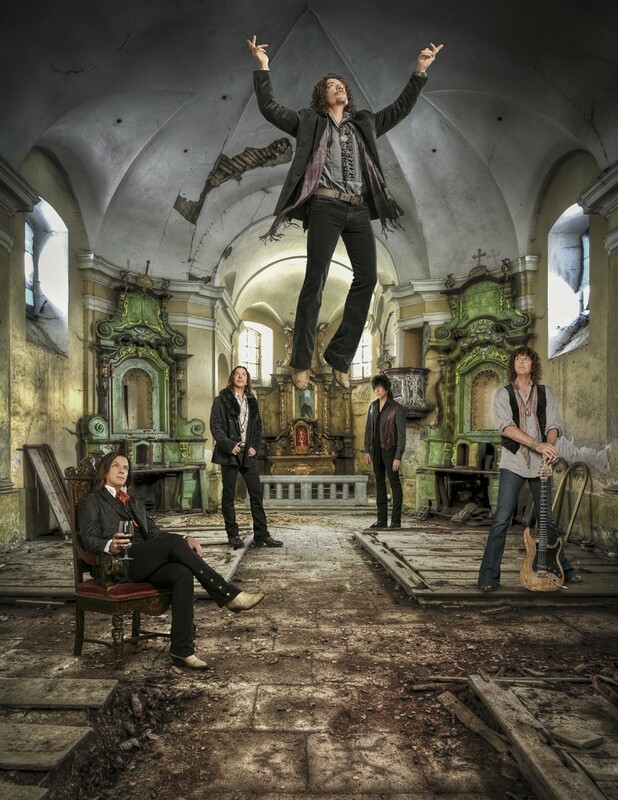 I’ve done two photo shoots with the band so far. The first series used decayed churches from Europe for the backgrounds, and the second session was at the same location where we shot the band’s music video for “No Money No Love.” I picked the two environments for different reasons. The decayed churches work conceptually with the name “Heaven & Earth.” The vibe and history felt right. 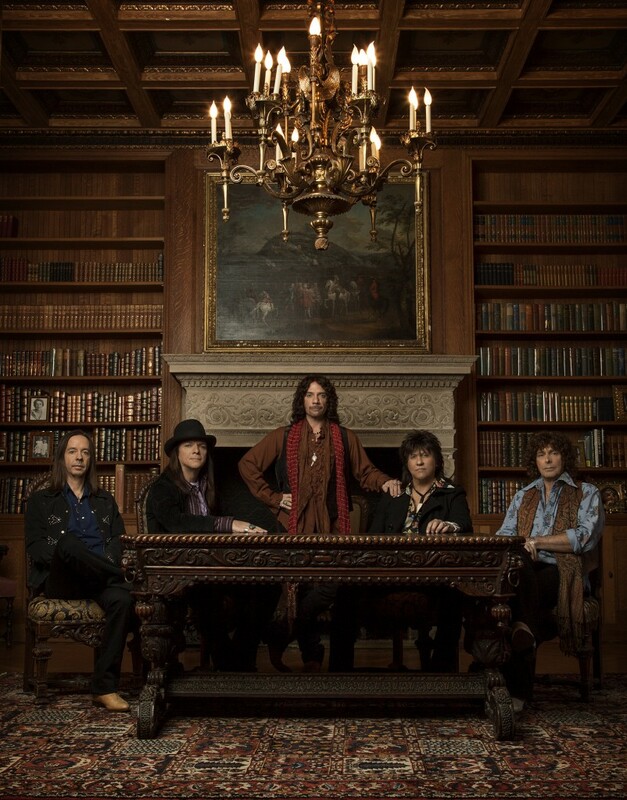 The shoot at the opulent mansion was a cool tie-in to the music video, but also works with the band’s image and with reclaiming the old school flavor of classic rock. 6. The Heaven & Earth logo (pictured below) is very powerful with the snake depicted wrapping itself around the lettering. Can you talk about why you feel that captures the essence of the band? In terms of conceptualizing the logo, using the snake as the ampersand resonates on a lot of levels as the connection between “Heaven” and “Earth.” I think on some level, everyone will have a visceral reaction to what this represents. My 21-year-old son, Ian, worked out the design of the logo, which coincidently is the same age I was when I first worked with Chuck and Richie.